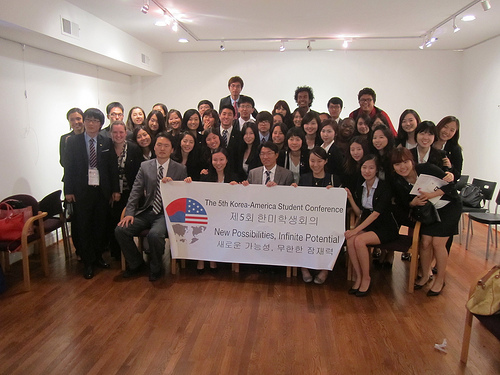 The sites and roundtable topics for the 6th Korea-America Student Conference have been announced! Jeju National University, Jeju Island. For more information, visit the KASC 2013 page. The International Student Conferences (ISC) Board of Directors and student leaders of JASC and KASC meet in Washington, D.C.
On November 16th, 2012 International Student Conferences (ISC) hosted their semi-annual board meeting in Washington, D.C.
Board members and student leaders met to share updates about the 65th JASC, to be held in Japan, and 6th KASC, to be held in Korea, this summer. Student leaders spent the weekend in Washington, planning conference content and coordinating their national recruiting effort. To coincide with the meeting, ISC held an open house in their office where alumni, board members, supporters, and students were able to enjoy each others’ company and discuss the upcoming conferences. More information about this summer’s conferences is available at iscdc.org/jasc and iscdc.org/kasc. 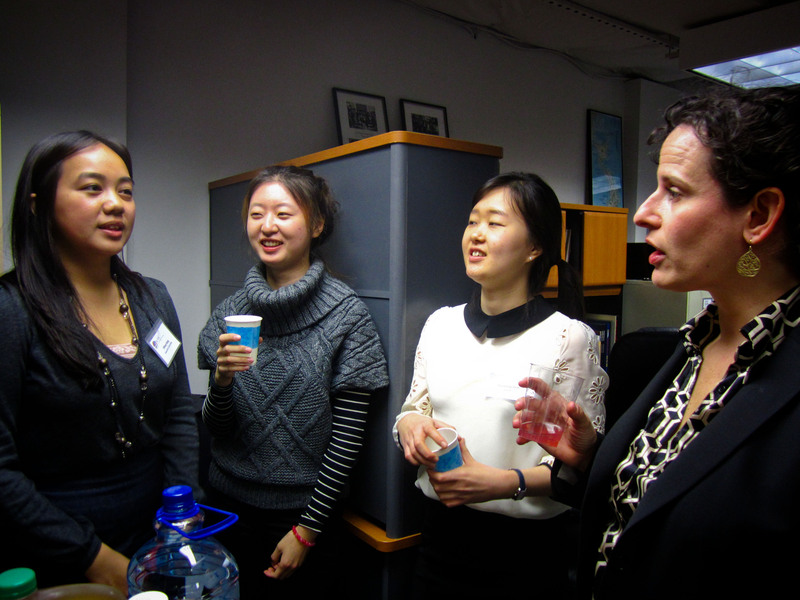 Tiffany Vang (leftmost) of the College of Saint Bendict and Chair of the KASC American Executive Committee chats with (from left to right) Seheun Jung, Hyunjung Shin (both ISC Interns and West Fellows) and Board Member Robbi Miller (JASC 47 alumna) at the ISC Open House. Also, for those in the D.C. area who missed the event, there will be a holiday happy hour on December 13th in downtown Washington. All friends of JASC and KASC are welcome to attend. More details available here. 성공적인 통일을 만들어가는 사람들(성통만사)이 지난 10~15일 스위스 제네바에서 진행한 북한 인권 캠페인을 성황리에 마치고 돌아왔다. 성통만사의 이번 캠페인은 국제사회에 북한 인권문제를 알리고 이를 개선하기 위한 목소리를 내는데 기여한 것으로 평가된다. 성통만사는 이번 제네바 방문에서 ▲제 21차 제네바 유엔 인권 이사회 참관 ▲대한민국 및 각국 대표부 방문 ▲국제 NGO 방문 ▲북한인권 야외 캠페인 등의 활동을 진행했다. 특히 14일에는 제네바 유엔본부에 위치한 영화상영실에 휴먼라이츠워치(Human Rights Watch) 등 국제기구 대표들을 초대해 북한 인권영화 ’48M’을 상영했다. 영화 상영 이후에는 김영일 성통만사 대표와 이성민 씨(한국외대 학생)의 탈북자 증언 시간도 이어졌다. 이자리에 참석한 국제기구 대표들은 “앞으로도 이런 영화들과 탈북자들의 증언을 자주 조직 했으면 좋겠다” “북한 인권에 대해서 말은 하지만 그 진상에 대해서 잘 아는 사람들이 그리 많지 않다. 좋은 이야기를 해주어서 고맙게 생각한다” 등의 참가 후기를 남겼다. 성통만사는 지난 10일 유엔본부 정문 앞에서 벌린 캠페인에서 북한주민을 상징하는 ‘Voiceless, Blinded, Truthless’라는 주제로 피켓 홍보와 포토존, 플래시몹, 탈북자와의 대화 등의 행사를 열기도 했다. 2006년 설립된 성통만사는 지난 7월 국내 북한인권 NGO중 최초로 유엔경제이사회(ECOSOC)로부터 유엔 각종 회의에 참석해 입장을 표명할 수 있는 ‘협의기구’ 지위를 받은 바 있다. In this interview, Kathy Hill (3rd KASC, member of the American Executive Committee) talks about her achievement in KASC and shares her thoughts on leadership. She is currently a volunteer at the Women’s Shelter of Central Arkansas where she finds courage and inspiration for her own life. 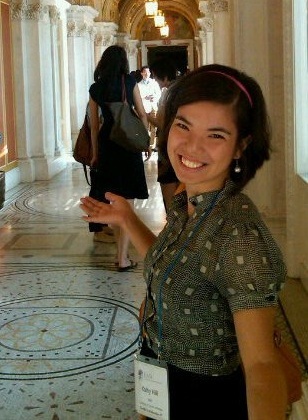 Check out her interview and learn more about Kathy! 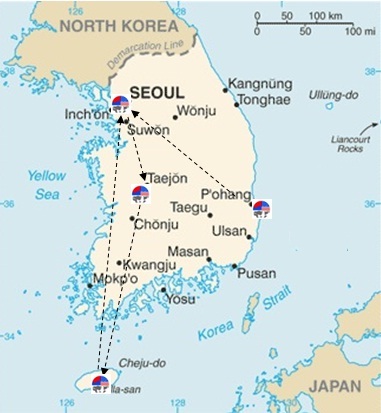 Korea Economic Institute featured the 5th KASC’s visit on July 16th on their website. 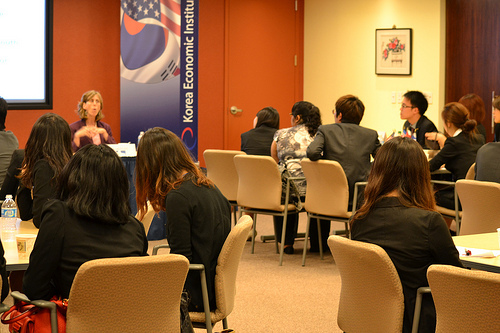 Delegates participated in the Six Party Talk Simulation and discussed inter-Korean and U.S.-Korea economic relations with Ms. Karin Lee, The National Committee on North Korea, Mr. Troy Stangarone, Korea Economic Institute and Mr. Bryant Trick, United States Trade Representative. 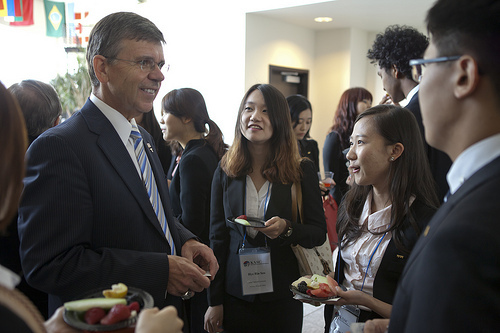 Korea-America Student Conference kicks off July 5! Trine president Earl D. Brooks II, Ph.D. is speaking with delegates at Opening Ceremony. 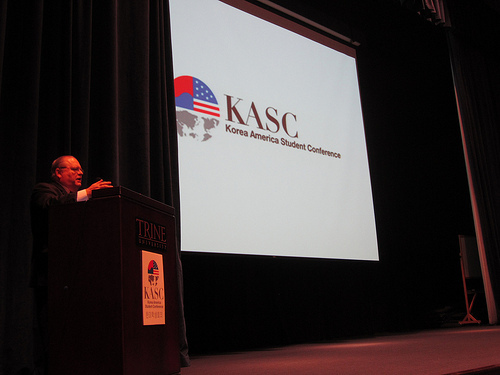 The 5th KASC Opening Ceremony was recently featured in Trine University’s newspaper. The delegates enjoyed the company of Dr. Brooks, President of Trine University (see photo), Indiana Senator Dennis Kruse, Angola Mayor Richard Hickman, and JASC alumnus Larry Ingraham. The Ceremony was followed by a reception at the James University Center. The 5th KASC visits the Korean Embassy in Washington D.C.
On July 13th, the 5th KASC delegation visited the Culture Center of the Korean Embassy for a briefing and a reception. Secretary Chusok Yoon spoke to the students about Korea’s economy and the close trading relationship between Korea and the U.S. Following Secretary Yoon’s presentation, the students asked frank questions about the U.S.-Korea Free Trade Agreement, Korean culture in the U.S., and American perspectives towards the Republic of Korea. After hearing from Secretary Yoon and other staff members from the Korean Embassy, delegates and guests enjoyed a Korean buffet provided by the Culture Center. Guests included ISC board members and alumni Robin Berrington and Deborah Gelin, as well as recent JASC alumni Dan Jodarski (62, 63,current JASC program manager), Leah Flake (61, 62), and Kunihiro Shimoji (62, 63). Also in attendance was Mr. Lee of the Korea Foundation. Kathy Hill (KASC 2 & 3) graduated from University of Central Arkansas with a Bachelor’s Degree in Sociology on May 5. 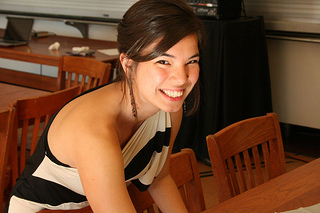 Now she’s getting ready to head back to South Korea as an English teaching assistant through the Fulbright program on July 4. On July 10th, KASC 5 delegates traveled to Chicago from Trine University to visit the Korean Consulate General Chul Hur at his private residence. 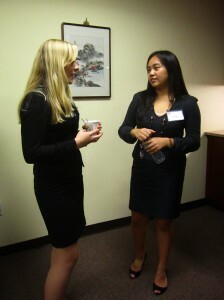 The delegates were joined by several other Consuls, including Mrs. Jeong, the Consul of Education. The delegation enjoyed a beautiful Korean buffet while chatting with the Consuls. The students had a wonderful time at the Consul’s residence and promised Consul Hur that KASC would visit again during its next trip to Chicago. KASC is featured in the Korean Consulate General in Chicago’s website. Today was a big day for the 5th KASC. The Opening Ceremony was held from 3 to 5pm at Fabiani Theater at Trine University, followed by a wonderful reception. The delegation was honored to have Indiana state Senator Kruse, Angola City Mayor Hickman, President of Trine University Dr. Brooks and JASC alumnus Mr. Larry Ingraham as the main speakers of the Ceremony. The speakers delivered inspiring speeches and mingled with delegates and guests during reception and dinner. 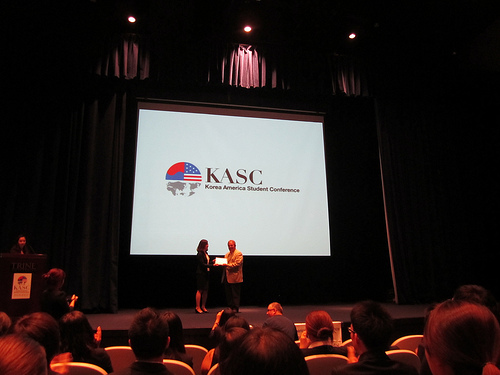 The Opening Ceremony marks a successful start to this year’s KASC, with an exciting month ahead for delegates. Check out the Trine University’s news which featured KASC!